Have a passion for clothing? We currently have a need for a clothing associate (or two) on either Mondays or Fridays, that can help our clients select donated clothing, hygiene items and more from our clothing closet. This is a once-per-week commitment on either Monday or Friday from 9:30am until 2:30pm. Look for friendly folks to help guide clients through the pantry. All weekdays needed (especially Wednesday) 9:30 am to 2:30 pm. Looking for an active volunteer gig and have an eye for detail? SnowCap needs you! The donation intake volunteer is a vital part of donations, providing receipts and being an ambassador for SnowCap are all in a day's work. This is a once-per-week commitment from 8:45am until 3:15pm. ​This one time per month opportunity is perfect for a volunteer with welcoming and caring personality who works during the day or isn't ready to commit to a weekly shift. You will talk with clients, make sure we have current information and do light data entry. Ready to Volunteer? Fill out the following Volunteer Application or for more information please click below for open regular volunteer positions. Current pantry & warehouse volunteer K.C. will vouch for us... volunteering at SnowCap is fun! 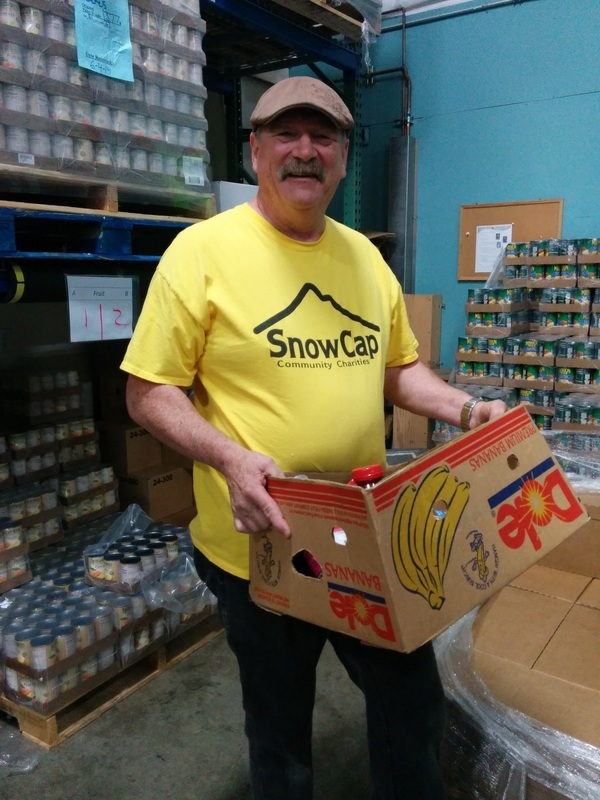 SnowCap volunteers make a difference for their neighbors in need. They feed thousands of people each month. This involves food drives, picking up and delivering food, sorting food donations, stocking shelves, and packing bags. It also means driving trucks, weeding the garden, working on committees and interviewing clients. There is also administrative work to do -- data entry, writing newsletter articles, thank you letters and sending reminder postcards. Thanks to this network of over 1,000 volunteers, children go to bed with full tummies, seniors are not forced to choose between heating or eating, and families can gather around a dinner table to share their day. Sound interesting? Great! Simply fill out the "Volunteer Application" on this page and click submit. It's that easy to get started helping your community today!